The woman pictured is not MaryAnne but another resident at Irving Street. MaryAnne was in her long, green trench coat and floppy, white hat. Even in a sea of other hurting and homeless women, she stood out to me. I was at the Women’s Emergency Shelter or the WES as we called it. She was quiet, too quiet. I would ask her questions and try to engage her in some kind of conversation. She never responded to me and often it seemed like she did not hear me or even realize that there were others around her. MaryAnne was at WES for about a year before my Project Manager let me know that we were working on getting her into the Irving Street Women’s Residence program. I admit that I was nervous about her coming here at first. She could not communicate and I wondered how able she was to take care of herself and how she would do in our community environment. She came into our program a mystery to us. She could not communicate her past or her experiences to us and we had no idea how she ended up at WES in the first place. It was a rough adjustment period when MaryAnne first moved to Irving Street, both for MaryAnne and for the other ladies already living there. She arrived at Irving Street in April of 2014 and the temperatures outside had already started to soar. Despite the heat, MaryAnne continued to wear her heavy, green coat and her floppy, white hat. She could sit for hours at a time in the sun, rocking back and forth in one of our rocking chairs. Beads of sweat would roll down her face and staff would worry about her health. MaryAnne also seemed to get frustrated easily around large groups or during loud events. Staff saw her express this frustration often by doing something destructive and even threw things during some incidents. As time went on, staff tried connecting MaryAnne to important community resources such as a doctor, a psychiatrist and benefits. Staff ran into barriers every step of the way. The biggest issue was the lack of background information we had on her. Many services wanted proof of a disability by a certain age and of course they all wanted a definite diagnosis. We had none of these things because MaryAnne was unable to communicate them to us. Sometimes MaryAnne would make it to one appointment that we scheduled for her, but then would refuse to go again with no explanation. Staff was becoming more and more worried as we watched MaryAnne’s mental and physical health decline. Over a few months, she was not taking care of her hygiene in any way; she was not eating properly and even caused a small fire in the community microwave. Her behavior, safety and wellbeing became such a concern to staff that we had to get emergency mental health workers involved as it was apparent that MaryAnne was “gravely disabled”. MaryAnne was placed on a mental health hold three times within two weeks. Finally, on the third hold, she was taken to Denver Health Hospital’s psychiatric emergency and at which point it was decided that she definitely needed a longer time to stabilize. MaryAnne was transferred to the in-patient psychiatric unit for stabilization. Denver Health’s involvement was the key that unlocked so many of MaryAnne’s mysteries. The first major thing we found out was that MaryAnne was not even her real name and she was originally from Indiana. During the time that she was in the hospital, we found out that she had been in Denver before, about 10 to 12 years prior and that she had mental health services during that time as well. They found that she had been connected to the Mental Health Center of Denver and that she had been diagnosed with schizophrenia. This was a HUGE piece of information, because with that diagnosis, we were able to contact Adult Protective Services to for assistance. At the same time, our staff was coordinating with the Social Worker at Denver Health to get MaryAnne reconnected with the Mental Health Center of Denver. As a team, we worked together to get a case manager from the Mental Health Center of Denver and a case worker from Adult Protective Services to meet with MaryAnne while she was still in the hospital and to evaluate her as she began to take mental health medications. MaryAnne was released from the hospital after approximately two weeks and she returned to the Irving Street facility. When she returned, she was able to communicate better and seemed like she was much more aware of her surroundings and of other people. Staff could see some positive changes, but we knew that we were nowhere near her baseline yet. Staff reconnected MaryAnne with MHCD. She was able to get a case manager and an appointment with a psychiatrist. Staff was able to transport MaryAnne to her first appointment with the psychiatrist. He was incredibly nice and seemed very understanding of MaryAnne’s situation. MaryAnne was started on oral medications at first and was later changed to weekly shots and now she in on once a month. Staff was amazed as we watched MaryAnne (now fully using her real name) come out of a fog that she had been in for at least two years at this point. She began to recognize other people and interact with them. MaryAnne even became aware of her own appearance and how others perceived her, which is a great sign that her mental health symptoms are starting to resolve. She was starting to tend to her hygiene issues and was even willing to try on some dresses, though she still has yet to wear one outside. Karen, the case worker through Adult Protective Services, was able to use the information we learned to track down MaryAnne’s family in Indiana. We found four living siblings that miss her desperately and had no idea where she had been for the last two years. We also found out that she has three living adult children living in Indiana. All the mysteries of MaryAnne were starting to unravel before our very eyes. MaryAnne had been at our facility for over a year at this point and she had never called me by my name until just a few weeks ago. I know that it does not sound like much, but to me and to our staff, it meant that she was actually entering into reality and that meant that we could really start working with her to get her where she wanted and needed to be. She began asking about buses and transportation and what she would need to get downtown to the Stout Street Clinic, which she was able to remember from when she was in Denver the first time ten years ago. One day at our weekly Women’s Group, MaryAnne took it upon herself to ask the other residents about catching the bus downtown. Another resident volunteered to take MaryAnne to the downtown library via the bus to teach her some of the routes. MaryAnne called me from the library and said, “Courtney! I’m at the library!” I could not believe that someone who could barely say “hello” was now calling me on the phone to talk and was excited to share her experience. Since then, MaryAnne has been talking and reading. She has been searching the internet and participating in group events. She is talking with the other women and expressing her desires for her future. 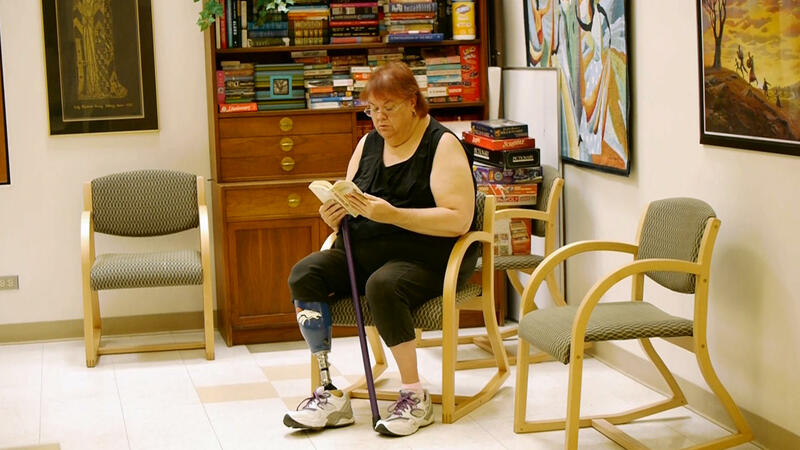 MaryAnne may never be able to live completely independently, but every day she gets closer and closer to a life that she deserves and we will continue working worth her as long as it takes until she is in the place that she wants to be.